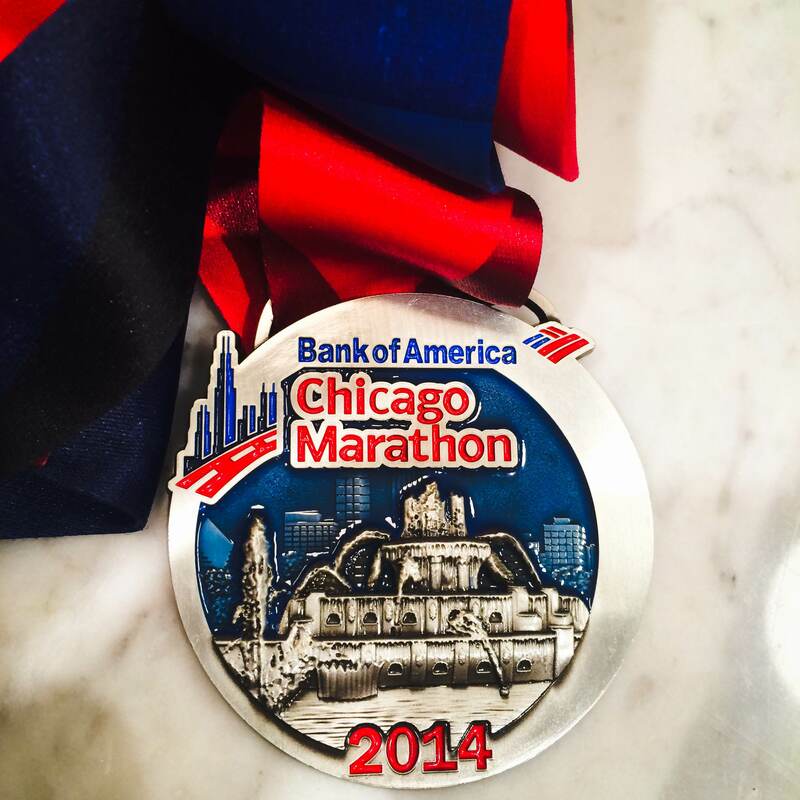 This past weekend I ran my fourth marathon(3rd Chicago)in three years. Each and every marathon I have completed has been a different experience. This past weekend I felt very much wrapped in love. The marathon route can be so fast and so looooong at times, but it is never a place I feel alone. The strength of a “man” as in “mankind” is shown with love and the embrace of people you know, people you love and who love you, training partners, and total strangers. A post about love and embracing cannot go on without acknowledging those who could not necessarily come out to cheer me on, rather they supported me by donating to the Team to End AIDS/T2/AIDS Foundation of Chicago. WOW! At last count, I raised $2522.41. All of those people showed love and support by digging into their pockets and making a donation. I promise while I was running knowing that I had support all over the country did mean the world to me. It’s not too late to make a donation either. Reach into your pocket and help support. Help change the story! I had a moment with a total stranger. It was a five second friendship, but he totally understood me. He got me and my hair!! 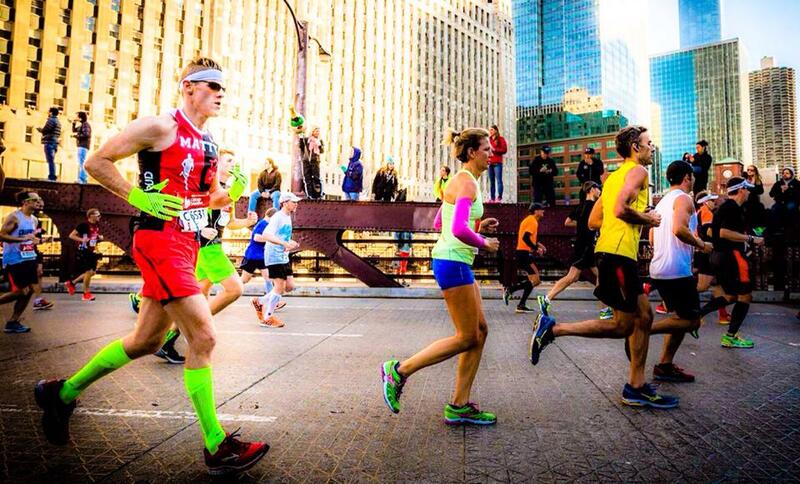 Seriously, the fan support for the Chicago Marathon is next to none. Of course there are 1.7 million spectators out there, most of whom are looking for their loved one, their friend, their co-worker, but there are also people who are just out to cheer and support. 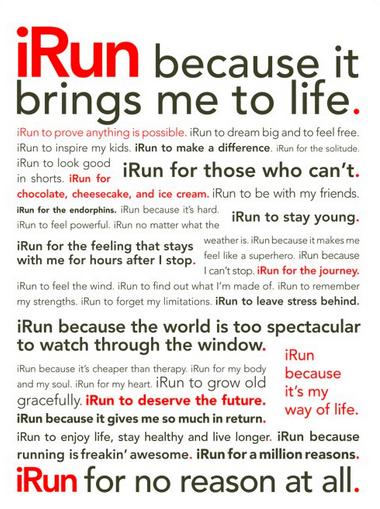 It is incredible the love and support for humankind that I feel while running the marathon. I always put my name on my shirt and it never fails that hundreds of people will shout it out, “Good work Matty!” “Way to go Matty.” “Looking good Matty.” People ask, “What do you do/think about for almost four hours? I watch the joy on spectator’s faces when they see their loved one. I get chills when I see runners turn around to give a hug to his friends. I listen for shrieks of elation as kids see their mom running strong. 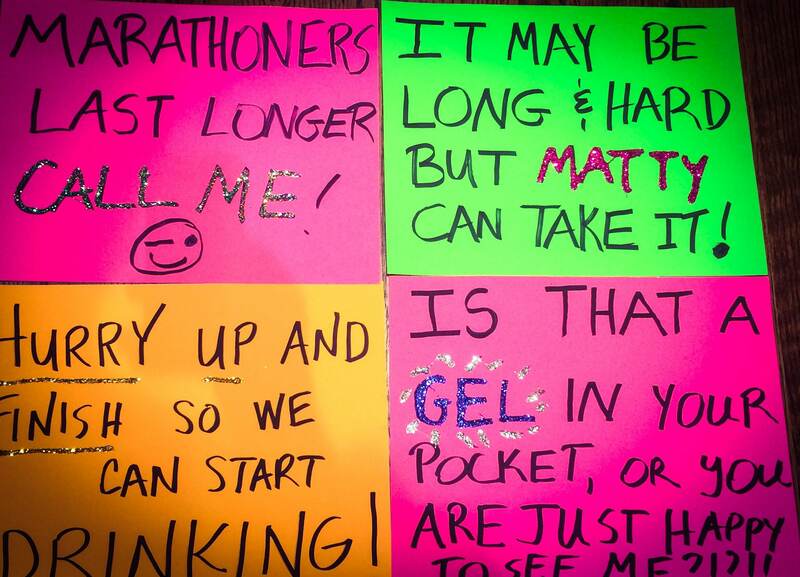 I look for the love that is shared for 26.2 miles. There are very few times in life that love is just shared without expectation. Running the marathon time and time again proves to me that it is possible. It is possible that humans will come out and support other humans, just because. 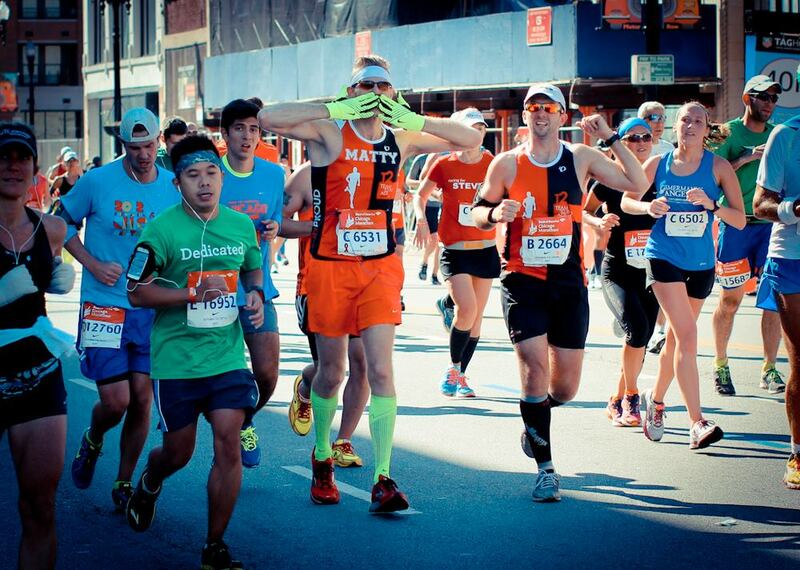 Just because running 26.2 miles is f***ing amazing and hard and deserves to be cheered on. But also just because it feels good to support other humans doing something they love or running in honor of someone or something, or just supporting people who get this crazy idea that they are going to beat Oprah’s time(4:29:15). I continue to run because it is the single thing in life that has brought me to a place of understanding what it feels like to be part of the team. Growing up I wasn’t an athlete. I wasn’t part of a team. Sure, I marched in band and sang in musicals, but nothing ever felt like a team until I started running. After my first marathon I began to get that feeling. Running on the Lake Shore path in Chicago I’d get a head nod here or a smile there from other runners. They understood what I was doing and I understood them, especially on those super hot days or cold days or rainy days when only us crazy runners go out. But not until last year did I truly understand what it is like to be part of a team. I joined the Team to Ends AIDS purely for two reasons: 1. To get a BIB for the New York City marathon and 2. To focus my energies on something good in midst of a break-up. Saturday after Saturday I would get up at 5 a.m. and head to the lake for a run. I’d meet my teammates, chitchat, and get to running. Week after week I would run with about the same crew as we were the same pace. Week after week we would chat about work, weekend plans, pains of running, fundraising, etc. Then, one Saturday as we got ready to run, one of my pace group leaders stood to give a talk. He raised his hand high with a green wristband acknowledging (+) his positive status. Then a few more guys came up and got wristbands. As I looked around, five of my 9 pace group running mates were HIV positive. No longer did I just join T2 to get into the NYC marathon, I was part of something much bigger. 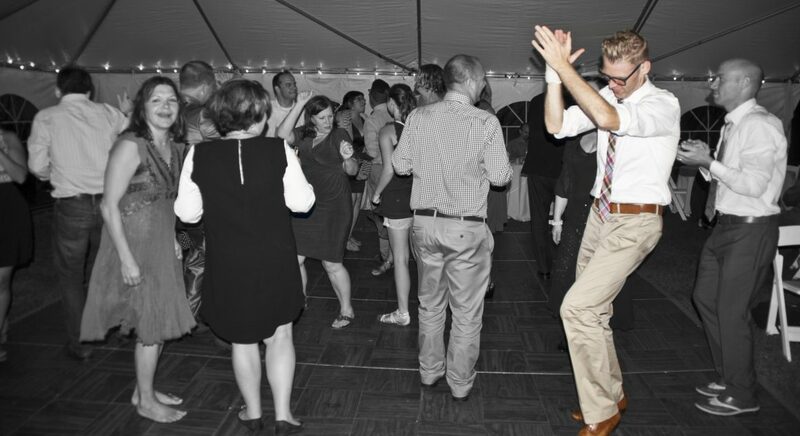 I was raising money and raising awareness for the HIV/AIDS epidemic. From that moment on, when I would go out running with my T2 shirt on and I’d hear other people on the path, “Go T2”, “Looking good T2,” I finally felt what it is like to be part of a team. I finally had that feeling that I so longed to have, that camaraderie that teammates share. I was part of a team that was raising money to help some of the very men I was running with week after week. I run because it reminds me that I’m alive and that we don’t always know what the person next to us is going through on a daily basis, but they keep going, and I keep going because it brings me to life. This past Sunday marked my second best time in a marathon, 3 hours, 50 minutes, 38 seconds. It’s an incredible time for me, not my best, but substantial nonetheless. When I tell people I was disappointed in my time, their mouths drop. Fine, fine, it is sub four hours and I will take it. What is more powerful than anything else is that I finished the race and kept that time. Everything was set-up to be perfect. The weather was in the low 50s, I trained since May, I took in fluids like I normally do and nutrition like normal too. At 13.1 miles I was at an 8:01 pace. At mile 15 I was at and 8:11 pace. For the first 17 miles I was well under my goal pace of 8:22/mile. After 18 miles, my legs started to get tired. Mile 19, my least favorite, I was sore. At mile 22 I saw the Team to End AIDS cheer bus. That gave me umph to keep going. Coach Chris caught up to me at mile 23. This is when my legs started to feel really tired and crampy, though nothing significant. With Coach Chris’s encouragement I kept running. When I’d try to stop and walk, he’d give encouragement. I made it to 40K where I saw all of my cheer crew together screaming, waving signs. I blew them a kiss. There is no way I could move to the side of the road at that point. I had to keep moving forward. What seemed like an hour was really just a few minutes. I just wanted to be done. I crossed the finish line. DONE! I didn’t meet my goal of under 3 hour 40 minutes, but it was still my second best race. Just a minute after finishing my legs seized up at the same time. The worst charlie horses I have ever experience hit my calves. My legs went into rigamortis. I screamed for Coach Chris. He finally heard me and came back. He dumped salt into my hand. I downed that and a banana. Along with a medic, he helped me hobble a little. Five minutes later the cramps subsided. Five minutes after that the right leg seized again. Three minutes after that the left leg seized. Finally after limping for 30 minutes I was at a bench surrounded by Gatorade, water, bananas and Coach Chris. He stuck with me when I know he wanted to greet others who had finished. He walked with me for another 20 minutes until we found my boyfriend. Coach Chris is my hero! I certainly would have finished the race, but not under four hours if he had not stuck with me. I choked back tears as he helped me, not because of the severe pain, but because he was there helping me and caring about me as a fellow runner and human. My friend Dave drove Kurt, Matt, and Artur around to two different locations. 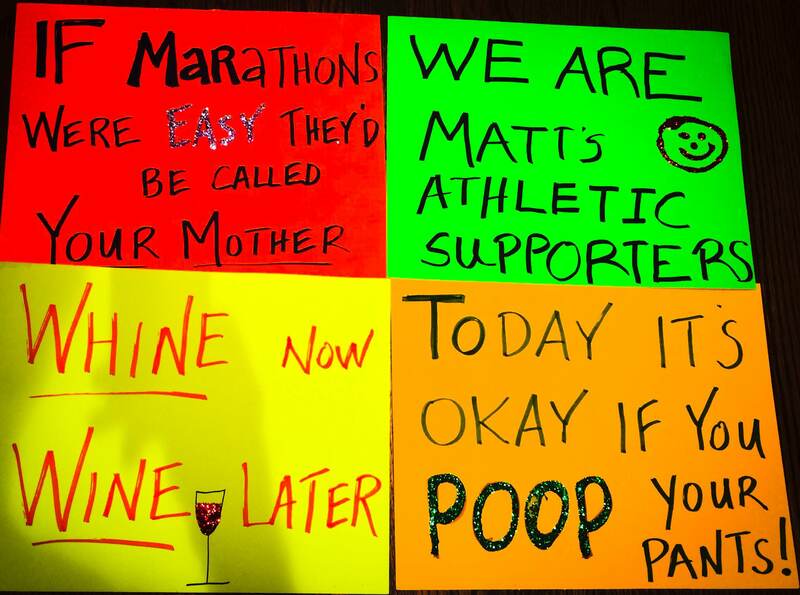 When I woke up marathon morning, I saw this sign on the table, Love and Whitney. 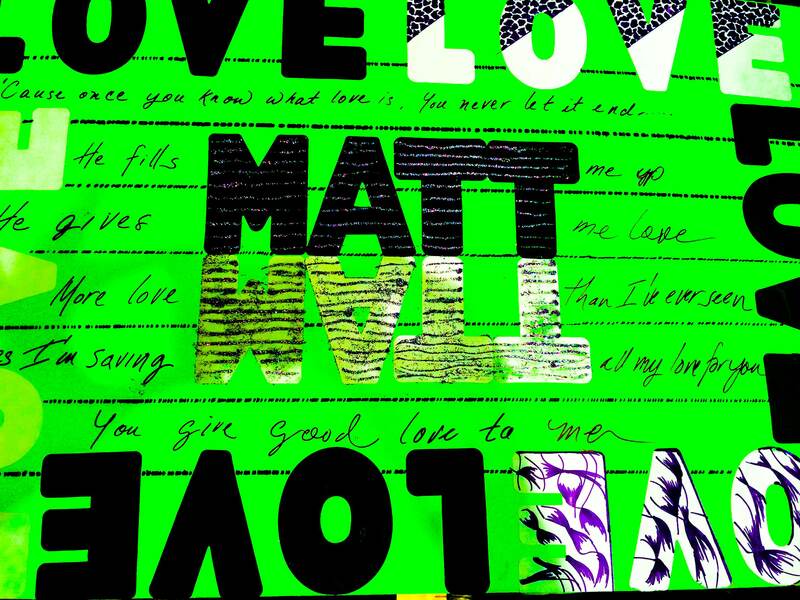 It takes a special boyfriend who cares to spend hours making a sign with Whitney Houston lyrics on it. I feel loved. I feel wrapped in love by my boyfriend, my cheer crew, my coaches, my family, and all of the people who have donated to the Team to End AIDS/AIDS Foundation of Chicago. On the marathon path it can get long out there but my cheer crew gave me such strength and energy, especially at 40K when I was tiiiiiirrrrrrrrrreeedd and just wanted to be done. Their love of me gave the extra gusto I needed to make it to the end. The cheering crowds up Michigan Ave. and rounding the corner at Roosevelt gave me the push I needed to step foot across the line. 26.2 miles, yes that is an accomplishment and with dedication I have trained my body to complete it. But I feel most accomplished in life because I am able to surround myself with some of the most amazing and loving people. Some I know from high school and some I’ve more recently met. What made me feel better than anything else on Sunday was that I felt wrapped in love by people I know and by total strangers. When you find love, whether of a friend or lover, cherish it. It keeps us going. Back in 2011 I set out to run a marathon for one of my milestone birthdays and to check that off my bucket list. Little did I know, I would be up to four marathons (3 under 4 hours) and more than anything, that I would inspire others to run. Back in high school I hated running. Hated it! I could barely run a mile, or more so, had little desire. After my first marathon in 2011, I wanted to do it again and again and again. Last year I ran Chicago and two weeks later New York City. 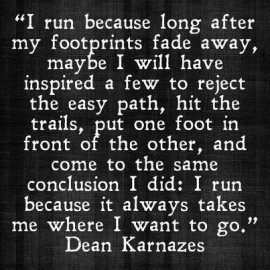 Since all of this running, several people from my past have messaged me to let me know that I inspired them to start running. Some have kept to the 5 K race while another, Leah, reached out to me and I encouraged her to train and run one. Just as it got me through a rough spot in my life, it did her too. Now she is set to run TWO marathons within 2 or 3 weeks this fall. I commend her and honor her here. She is inspirational. And she’s a running rockstar mom. Go get that course and run your heart out Leah!! I am with you in spirit. 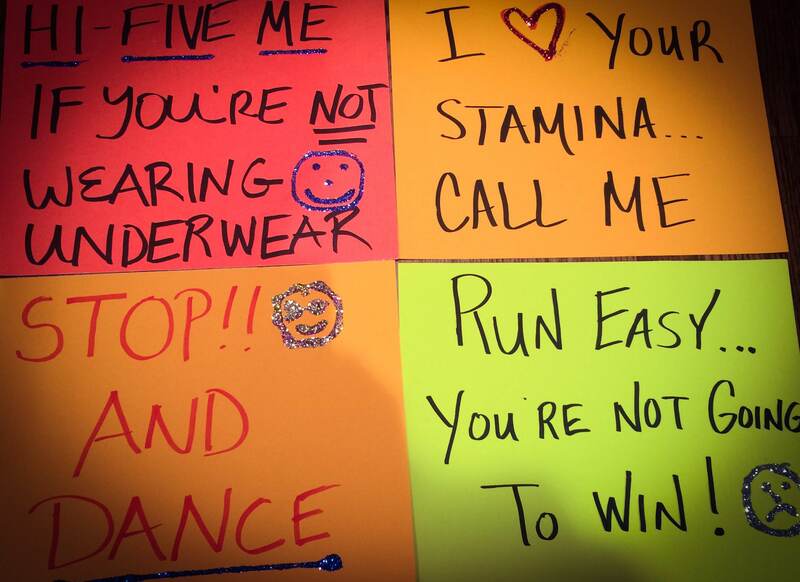 If you want a few signs, I have some great ones you can borrow!! So what is this long blog post all about? Running? No. The marathon? Not really. Signs of encouragement? So awesome, but no. It’s about l-o-v-e. It’s about humans supporting humans; strangers supporting strangers. This blog post is about getting out there in life and keeping going even when it’s hard. It’s about putting one foot in front of the other and why you do that is because of love. You do it because people love you and YOU LOVE YOURSELF. You are important to a lover, or a friend, or a niece or nephew or family member. If you’re really lucky you have all of the above and even if you don’t, just know that somewhere out there, whether it’s on a marathon course or just walking the streets of your town, someone you don’t know, a total stranger, supports you. And, if you are very lucky in life, you are surrounded by love always. Look around, it is there. Wrap yourself in love.